There are a number of methods of bottling, which method to use will depend on what produce you are bottling and your own preference. However, for bottling vegetables where they have low acidity and there is, therefore, a definite botulism risk, you must use the pressure method to ensure your safety. With all methods, ensure the jars and lids are scrupulously clean before you start. If you have a dishwasher, running them through it on the hottest cycle or even a sterilise cycle which some have is a real time saver. Otherwise, wash by hand in soapy water as hot as you can, rinse and scald with boiling water. Packing the contents in when the jars are wet will help things slide in, using your wooden spoon to pack tightly. Soft fruits should be packed as tightly as possible in layers without squashing and adding syrup or water every 4 or 5 layers. Hard fruits may be pressed down with the handle of a wooden spoon and the syrup or water poured down the sides of the bottle gradually until it covers the fruit. Twist the bottle from side to side and gently agitate as you add the syrup or water to remove any air bubbles. Most varieties of tomatoes (all the heritage types) are fairly acidic which assists in the preserving process. However, some newer varieties are very sweet which has been due in part to breeding for reduced acidity. These sweet varieties with low acid are best pressure bottled rather than being treated like fruits with oven bottling. This method is not suitable for light coloured fruits which discolour in the air like apples, pears, peaches, apricots etc. or for tomatoes. It is quite simple and easy though. This method can be used for all types of fruit and also for acidic tomatoes. The fruit is packed into heated sterilised jars and the boiling syrup or brine or water added before returning to the oven to process. The benefit of this method is that fruits do not tend to float to the top of the jar and it is actually quite energy efficient. It does take some skill and practice to get the timing right though. A thermometer is really required for this method. The fruit is packed into the jars and cold syrup is poured over. Put the lids onto the jars and then place on a rack or trivet in the bottom of the pan, ensuring there is a little space between the jars. Bottling under pressure is the most energy efficient method as raising the pressure increases the boiling point of water and thereby the temperature that the food is processed at, so reducing the amount of time taken. 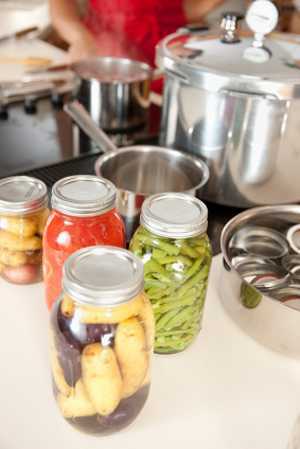 For bottling vegetables and tomatoes with low acid content, pressure bottling is the only safe route as the botulism bacterium can survive boiling water. The higher boiling point temperature for the period given guarantees the bacteria are dead.